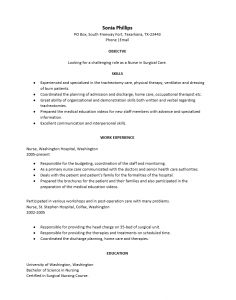 The Medical Surgery (Operating Room) Nurse Resume Template offers a clear framework for those wishing to compose a resume. Each section contained is geared towards presenting a candidate’s information in as organized a manner as possible while maintaining a certain professional look and feel to the document. This will prove important as this is one of the largest segments of the nursing population (Nearly 1/6 of nurses are medical surgery nurses). 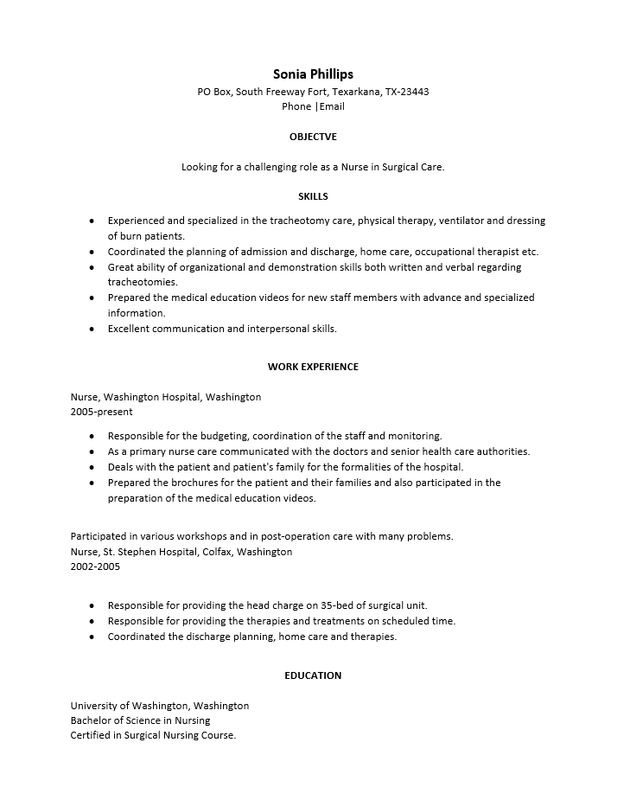 Applicants must be ready for a true competition for these positions while many nurses will specialize in medical surgery and some will use it to gain experience for related positions there are only so many positions available. When initially composing a resume, it is always a good idea to keep in mind this is the first impression a potential employer will have of a candidate. Thus it is vital it be polished and elegantly composed. A job seeker should make it a point to show off their knowledge of procedures and terminology while remaining succinct. In addition, their resume should be geared to the specific position they are applying to. This is easily done by simply altering the master copy created by the template. By putting careful thought and consideration one can devise a winning resume which may gain them an interview. Step 1. Place your full name on the first line of the resume. Step 3. Your phone number and cell number should go on the fourth line. Step 5. Write your professional email on the fifth line. These initial five lines should have a business card feel to them. Step 6. State your professional goals and purpose for sending the resume. This may be one to three brief statements. Step 7. Make a list of your nursing skills. Place this list in the “Skills” section. Step 8. Organize a list of your employment history in reverse chronological order. Include the official job title you held, where you worked, the city and state of the place of employment, a range of dates you worked for them, and a description of what you did there. Step 9. Place your academic credentials in the “Education” section. Step 10. In “References,” report the professionals you have worked with who will give you a good reference. Make sure you have permission to do this.